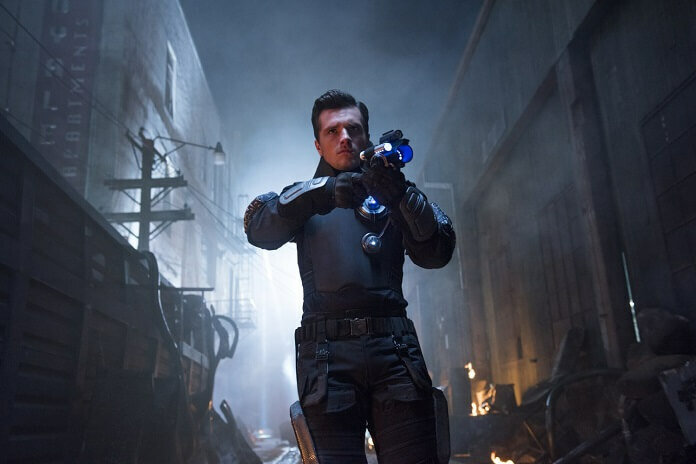 Hulu’s new sci-fi comedy series Future Man stars Josh Hutcherson (The Hunger Games franchise) as a janitor named Josh who’s an expert gamer. Josh’s video game skills earn him the job of preventing the extinction of mankind, and his mission to save the world involves jumping to different time periods. Seth Rogen and Evan Goldberg direct and executive produce the series which was created by writers Kyle Hunter and Ariel Shaffir. Future Man is set to debut on November 14, 2017. Hutcherson was among the Future Man cast that made the trek to the 2017 San Diego Comic Con to promote the half-hour series. In addition to taking part in a panel, Hutcherson sat down for roundtable interviews to delve into what viewers can expect when they tune in to check out Hulu’s Future Man. What are you excited for the viewers to see in Future Man? It goes off on funny tangents? You play a gamer so does the show explore a broad range of video game styles or include lots of video game references? Of all the different time periods your character goes to, which is the biggest surprise for your character? Did you get nostalgic for all the different eras you go through? Is this first season a self-contained story or does it lead into a second story? We know you go to the ‘40s, ‘60s, and ‘80s. Is there anywhere else you go that you can talk about? How does this future compare to the one Peeta was in in The Hunger Games? Was there anything you found challenging about the show’s comedic elements? What do you think is your character’s best trait? Was it fun to show off your dance moves in the series? For those who haven’t seen the pilot, are you doing a dance-off to save the world? Are those moves all yours in the moon suit?